We’re back! During most of October, WSJSociety.com was up and down. Chances are if you visited, you got an error message about how the system had a problem with the database. Remember all of those esoteric error messages we used to get on those early systems? I haven’t missed those, have you? Well, that should all be past now. McDill did a re-set. They moved WSJSociety.com to a new server and updated the software. I just checked, all of the plugins to our WordPress system are current. Everything seems to be a bit faster and working properly. So, let’s talk about ‘Reset.’ Reunion 2014 was great. Everyone had a good time. Alex Molinaroli led us through the major changes taking place in the company. Markets change, and Johnson Controls is changing to meet new market challenges. Emily Callaghan led us through a discussion . . . “Re-imagining the Society.” Like changing markets, the needs of our community, retired or in-career at Johnson Controls, are changing. As Gene points out in his message, our 25th Anniversary is a good time to re-evaluate, to re-imagine our society. My title here jumps the gun a bit. Before anything is ‘reset,’ we need to better understand just what we want to accomplish with in the WSJ Society, our community. We started the discussion with Emily at the reunion. 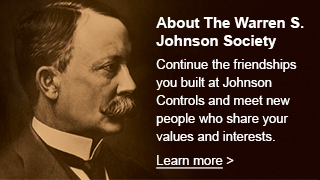 I’d like to continue it here at WSJSociety.com and expand participation to all current and former employees of Johnson Controls, regardless of location, years of service, in-career or retired. Please let us know your ideas. Why should I be interested in the the WSJ Society? What good could the society do for its members, for any Johnson Controls employee, and, for the community in which they live? That’s pretty broad. Your responses will help us get a better focus. You can offer your ideas by clicking on the Help button on the blue bar at the top of the page. Select the Topic: Message to the Editor and fill in the boxes with your contact information and ideas. That will generate an email to me. I’ll compile the input and report regularly in this column. This is not be the best way to conduct a discussion, but it’s the only way I currently have to be open to members of the Johnson Controls community who are not currently members of the Society. For members who have registered on WSJSociety.com, login and visit the Group/Open Forum. There you can initiate a discussion point for all to consider and comment on points raised by other members. Gene said it well . . . let’s see where this road takes us . . . I’m eager to hear from you.